From a chapter of Peg Bracken’s “I hate to cook book” entitled “Canapés and Heartburn Specials; or – WHO STARTED THIS BUSINESS?”. Good old Peg. 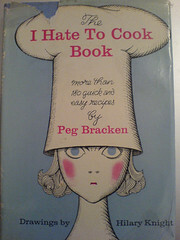 Her book is full of recipes involving condensed mushroom soup and packets of French Onion Soup Mix and cheery disdain for people with “fat cookbooks”. Peg seems to live in a constant hair-pulling whirl of party invites populated by people called Ethel who “deep-fat fry small objects or wrap oysters in bacon strips”. My book comes complete with someone’s scrawled notes over it in pencil, which get increasingly exasperated as the pages turn, like, “what IS this?!?!?!?!?! ?” and “NO“, and “try my frozen onion mix”. Whole party selections are crossed out, like Previous Reader just couldn’t stand it anymore.